It took all of 100 days for the San Francisco 49ers and quarterback Jimmy Garoppolo to realize that they wanted to be together for the long term.Garoppolo signed a five-year, $137.5 million deal with the team on Thursday night. On the 101st day, Friday at Levi's Stadium, the Niners reintroduced Garoppolo as the NFL's highest-paid player in terms of average annual value. They did so in front of a large crowd full of media, 49ers staff members, players and personnel executives and Garoppolo's family. The Niners even went so far as to adorn the stadium with large photos and banners welcoming the Garoppolo family back to the Bay Area. Somewhere in between Day 1 and Friday, Garoppolo led a 1-10 team to five straight wins to close the season, grew close to a new group of teammates and made general manager John Lynch and coach Kyle Shanahan go all-in on him as the franchise quarterback. "Once we first got Jimmy, we knew exactly how we felt about him," Shanahan said. "But where we were as a team at that time, where Jimmy was in his situation, I thought it was going to be hard for him to go in there and really get enough time to where he could show us and himself a deal where we would be comfortable. We didn't really think about it too much because you always had that franchise tag. "We knew Jimmy was a guy we wanted here badly. When he did get his opportunity and how he started out versus Chicago then versus Houston, Tennessee to Jacksonville to the Rams, each week kind of got better. The more Jimmy was here, the more comfortable he was, the better he played and I thought the guys around him played better. I think our team got tighter. "We always felt very strongly about his talent, but when you get to be with a guy for that long and you have that success and the guy is the same every single day, you get a better idea of how he will be long term and how he would be with a bunch of money and things like that. It always starts with talent, but when it comes to things like this, character and who he is as a man is everything." How the 49ers feel about Garoppolo never seemed to be in doubt based on their words, but their actions also backed that up. ESPN's Adam Schefter reported some of the numbers in Garoppolo's deal on Friday, including a total payout of $42.6 million in the first year if he hits all roster and workouts bonuses ($37 million of which will count against the 2018 salary cap) and $48.7 million fully guaranteed at signing. The deal came about quickly, particularly considering how difficult negotiations for franchise quarterbacks can be. That's a testament to not only the Niners' desire to keep but also Garoppolo's desire to stay with a franchise he barely got a chance to know over the past three months. "Personally, I knew I wanted to be here and I think it got figured out fairly quickly," Garoppolo said. "I'm really happy the way it worked out, and I'm glad to be here now." The timing of Garoppolo's contract came as a bit of a surprise, if only because there were some who believed he might wait to see what others, such as pending free agent quarterback Kirk Cousins, might get on the open market first. Garoppolo said Friday he had no interest in such tactics, a point driven further when he and his family escaped their hometown of Chicago just before a snow storm to return to the Bay Area for Friday's news conference. "This is where I wanted to be, honestly," Garoppolo said. "I wanted to get this deal done as fast as possible. It's only going to help our team going forward and going into free agency. It is 75 degrees out here, it's not a snow storm like in Chicago. It's a lot better here. So, I wanted to be here, I was excited to be here and I'm happy it got done as fast we did." While Shanahan had talked openly of using the franchise tag to keep Garoppolo during the season, he did so mostly because he didn't believe there would be enough time to fairly evaluate him and have a handle on what type of contract he should get. By the end of the season, though, Garoppolo had surpassed expectations, to the point where the 49ers were no longer concerned with sample size. The day after the season, Garoppolo ventured to Lynch's office and the two sat down to discuss their outlooks for the future of the team and the quarterback. It turned out to be a shared vision. "We had a great talk about what our aspirations are, how we want to go about this together, how much he enjoyed working with Kyle and (quarterbacks coach) Rich Scangarello and his staff and how much he enjoyed his teammates and we talked about where we want to go and he's very driven by that," Lynch said. "What we learned in the last three months is what kind of person this guy is and at that point we were full speed ahead on trying to get this done." Since the season ended, Garoppolo has been spending his time at home in Chicago, relaxing and working out. He will soon head to Los Angeles to begin his usual offseason workout routine before returning to the Bay Area for the start of the offseason conditioning program. Garoppolo, Shanahan and Lynch are all eager to see what Garoppolo can do when he gets a full offseason to absorb Shanahan's playbook rather than the crash course he took to get ready to start the final five games. When he does get back to northern California, Garoppolo is also looking forward to exploring his new home, something he didn't have much time to do in those final couple of months. 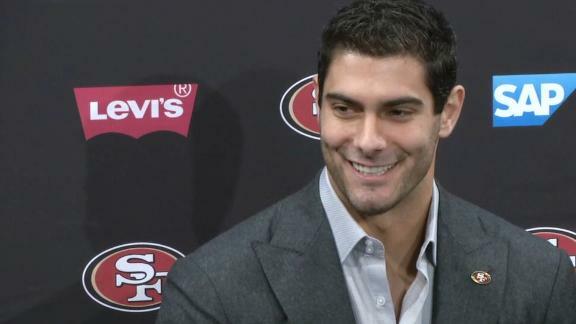 "I'm excited to make this my home for the next five years, hopefully more," Garoppolo said. "I hope to be here for a long time and get to experience all the good things about this area." With Garoppolo, 26, under contract, the Niners can now turn their attention to other offseason business. Even with Garoppolo's massive contract on the books, Lynch said only two other teams will have more salary cap space than the 49ers this offseason. Armed with money, weather and a franchise quarterback to sell, the Niners hope Friday is just the first big press conference this offseason. "Heading into free agency, this is a big deal," Lynch said. "It's 75 degrees and sunny outside, we've got this guy, who wouldn't want to be here? We want to become a destination where everyone wants to be. This is a big day for us but we've got a long way to go." Jimmy Garoppolo is glad his new deal was done quickly and thinks it will help the 49ers attract free agents.